Last week, I mentioned that the kids show Angus heifers throughout the year. That is an excellent lesson in commitment, animal nutrition, animal welfare as well as personal responsibility! What a perfect opportunity for kids to learn about, and fall in love with, cattle! As a kid, I showed heifers and steers as well, and I learned much about what kind of work it takes to be a cattle rancher, as well as made contacts with people from across the nation who are also involved with cattle. And...I learned what it is like to befriend an individual cow! Okay, I know that sounds goofy...but cows have personalities just like dogs, horses and any other animal. They can't talk, but they can show you their appreciation and interest in you. Show cattle are very pampered--much more so than "regular" cattle--but in order to attend the shows and look their best, they must have special attention. First of all, the selection of a calf to show is important. The competition is based upon physical appearance of the calf, so my kids spend a lot of time sorting through all our calves born in a year to pick the best ones. We have around 200 Angus calves born in one year, so that is a lot of calves to look at in order to pick the best 5! The next thing is to feed them well. We have an animal nutritionist who we are in close contact with as our cattle grow and age, and their nutritional needs change. Yes, cows are ruminants, who are capable of consuming roughage (grass) and converting it to muscle. But fed alone, grass does not meet their entire mineral and vitamin needs. In order to have a healthy calf, a rancher must supplement their grass intake. At the same time, a calf needs a number of vaccinations. There are numerous diseases that will kill cattle that are preventable. We must vaccinate for these diseases at the appropriate time in a calf's life. Once a show calf is selected, and started on a well-balanced diet, the kids begin to teach it to lead and stand for a show. There is a specific way that they are expected to stand...with their feet firmly placed under them in a comfortable way, with their head held proud. Much like a dog is taught to sit, cattle are taught to lead and stand. They are not nearly as smart as a dog, but they can be taught through a system of rewards. If you watch a cattle show, you will see the showman use a long stick to touch the calf's feet and scratch their belly. Show cattle love this and I have often seen a calf nearly go to sleep during the show while their belly is being scratched! In Kansas, summer daytime temperatures can easily reach 100 degrees, so we keep our show cattle in the barn to guard against heat stroke. Cattle that are in the pastures on grass are provided with ponds to swim in and trees for shade to keep them cool, but show cattle must be kept close to be worked with and are not able to be kept in a pasture. So we bathe them and use fans to keep them cool. The kids are responsible for feeding, grooming and taking general care of their own show calves. Another responsibility of showing cattle is to tell the good news about ranching to anyone who asks questions! At the county fair, people walk through the barn where the cattle are stalled and often ask to pet a cow. My kids love this! They love to show off the animals that they have raised and worked with....and they love to answer questions about how to take care of their cattle. I encourage everyone to find a fair or a livestock show in their city or town and go see the beautiful, healthy animals on display! The kids have worked hard with their livestock to be able to bring them to the show and they enjoy answering questions about them. You know, show cattle are pampered little pets, but as a rancher, I do my best to take good care of ALL the cows and calves that I own. I don't want any of them to get sick or die, and not only does it break my heart to have sick cattle, but it hurts my wallet! We do our best to keep cattle healthy year round and that includes vaccinations, antibiotic treatments and sometimes a trip to the veterinarian. We spend many thousands of dollars a year on medical expenses for our cattle. All cattle will be exposed to viruses, stress, and even lethal diseases. As a rancher, it is my responsibility to do everything I can to protect my animals. There is nothing better than going to the pasture in the morning, with a hot cup of coffee to enjoy while watching the mama cows and baby calves walk through the dew-wet grass as they make their way to the pond or across the pasture to another grazing spot. That means they are healthy and I am doing my job! That gives me a lot of pleasure--it makes me smile to just think about it! And I look forward to this year's county fair when we will take 10 head of cattle to display and my kids will have an opportunity to spread the good work about ranching and raising beef for America! Just came across this post and absolutely love it. 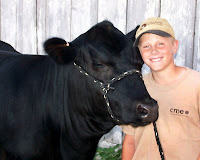 My older son, who is now a senior in high-school, just showed his last steer at the county fair and will start showing open heifers once he enters college. You are so right, they all have their personality and are quite pampered (and I for one have as many pics of the steers in my cell as of the kids, which is kind of pathetic :-)).